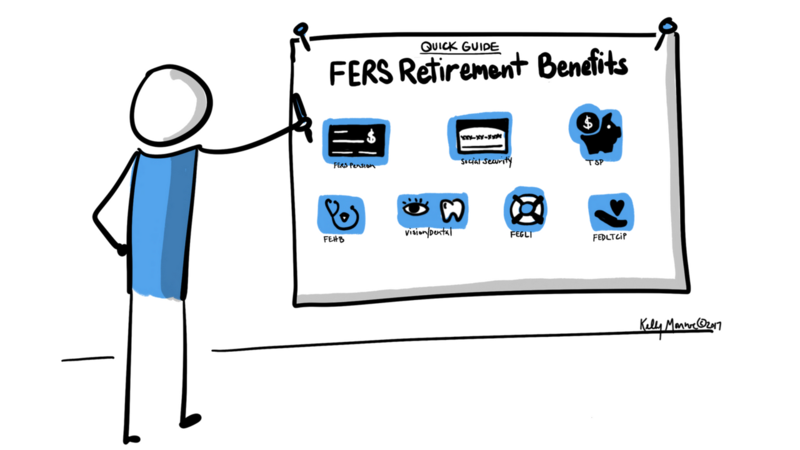 Many employees struggle to nail down exactly what FERS (Federal Employees Retirement System) includes, what the rules are and how much it will cost them. We all know how time consuming it is to track down information and then set about understanding it—all the while working a demanding day. When we hear about retirement, we hang on every word hoping to be able to piece together the information. As a FERS employee, you have 7 distinct retirement benefits to help you retire comfortably! It’s helpful to think of the benefits in terms of what they do for you in retirement. The first three benefits are income-based, which means money in your pocket. The next four benefits are insurance-based, which means “rainy day” protection for you and your family. Each benefit is subject to eligibility requirements. FERS gives you three sources of income when you retire. FERS PENSION This benefit gives you a monthly check for as long as you live in retirement, with a benefit for your spouse if you pass away first. The amount you get in retirement is based upon how long you worked for the Federal government, what age you retire and how much you earned. You can get more money each month from your unused sick leave, as well as military service with deposit. There is a cost of living adjustment (COLA) that can permanently increase your monthly check each year. Your Annual Leave is not included in your FERS pension calculation. You must meet age/years of service eligibility. There are no earnings limits to receive the FERS pension. Click here to learn how FERS pension is calculated. There is an additional benefit that you may receive called FERS Supplement (sometimes it’s referred to as the “Social Security” Supplement). It’s only for eligible, long-term employees who retire under age 62. This is a separate benefit from FERS pension. It’s calculated based on your years of FERS service and Social Security benefit at age 62. It is NOT paid by Social Security! The FERS Supplement stops when you reach age 62, and it has the same earnings limit of Social Security. SOCIAL SECURITY This benefit gives you a monthly check for as long as you live, with a potential benefit for your spouse if you pass away first. The amount you receive from Social Security is based upon how much money you earned over your entire work history (not just Federal employment) and at what age you are when you start receiving your benefit. The older you are, the more you’ll receive each month (maximum at age 70). There is a cost of living adjustment (COLA) that can permanently increase your monthly check each year. You must meet age/years of work eligibility. There are earnings limits on Social Security benefits until you reach your Full Retirement Age. The Full Retirement Age is determined by year of birth. Click here to read 5 Social Security Tips. THRIFT SAVINGS PLAN This benefit is a long-term savings plan that can give you a monthly check. There are many ways to set up income (withdrawals) from TSP in retirement; however, there are IRS age requirements. The amount you receive from TSP is decided by you. Your account balance is based upon how much money you contributed over your career plus your FERS Match and how your investments performed. TSP offers a Traditional TSP and Roth TSP. The investment options remain the same in retirement. 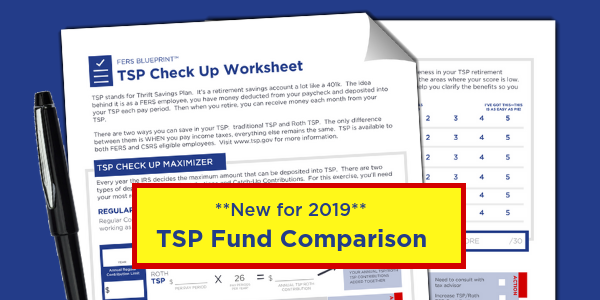 Click here for the TSP Check Uptm Worksheet + Video Lesson. FERS provides you, your spouse and your eligible family members with insurance coverage options when you retire. FEDERAL EMPLOYEES HEALTH BENEFITS (FEHB) This benefit provides health insurance for you, your spouse and eligible dependents that you can take into retirement. The share of cost and choices stay the same in retirement. You, as the employee, must meet eligibility requirements. FEDERAL EMPLOYEES DENTAL AND VISION INSURANCE PROGRAM (FEDVIP) This benefit provides dental and/or vision insurance for you, your spouse and eligible dependents that you can take into retirement. The share of cost and choices stay the same in retirement. You can opt in or cancel your coverage during Open Season each year. FEDERAL EMPLOYEES GROUP LIFE INSURANCE (FEGLI) This benefit provides life insurance for you, your spouse and eligible dependents that you can take into retirement. The share of cost may change; however, there are flexible choices to suit your needs. Some options may even be free of charge in retirement. You, your spouse, and eligible dependents must meet eligibility requirements. FEDERAL LONG TERM CARE INSURANCE PROGRAM (FLTCiP) This benefit provides long term care insurance coverage for you, your spouse and eligible family members. You can take existing coverage with you into retirement; or apply for coverage after you retire. Coverage subject to underwriting approval at time of application. Plans can be customized to suit your needs and budget. What most people do is they try to guess how much they should save in TSP. The problem is, if you guess wrong, you might not have enough money 10 years or more down the road into retirement. Instead think about it like this. Because FERS and Social Security usually isn’t enough to cover all of your expenses, it leaves a gap. This means that you have more expenses than money. You’ll need money from TSP to help bridge that gap. You can base your TSP savings goal on your age at retirement and how much you need to take each month plus inflation. Expenses have a way of creeping up. This could mean that you’ll need more money from TSP. Set your TSP savings goal with care and consider adding “wiggle room” (extra savings to handle the unexpected).